We often get asked how to design a walk in closest during our remodel projects. Sadly not everyone has the ability to get one because of the limited space in your existing home (Check out our post on small closet organization if you are in a tight space). If you are one of the lucky ones that do not have the pre-built constraints or are designing your new home or addition this post is for you. We go over some of the most important factors to consider while designing the walk in closet of your dreams! Before you can even think about building a walk-in closet, you need to know what you have. Creating a list of everything you would want to store in your closet is a critical step to your dream closet. Make sure to list what needs secure storage as well as anything that requires specialty storage as this will come in handy when planning accessories. A closets hanging space will be completely different if your wardrobe consists of cocktail dresses instead of jeans and t-shirts. Even though you are going to have this amazing new space to store everything you could ever want you want to do your best to purge. Decide what you want to keep, and what you want to get rid of in your existing closet. There is no point in cluttering up your new space with items you will no longer need. When given a large amount of space people tend to place items wherever to fill up the empty space. This leads to all sorts of clutter that is very easily avoidable. In order to best utilize your closet create specific locations for all of your articles of clothing. Utilize specific storage accessories like shoe racks, pants racks, and dressers to give each item its own home. This is YOUR dream closet after all, isn’t it? Place photos or artwork that make the space feel more welcoming. Incorporating a nice seating area or a TV can help add multiple functions to your walk in closet. 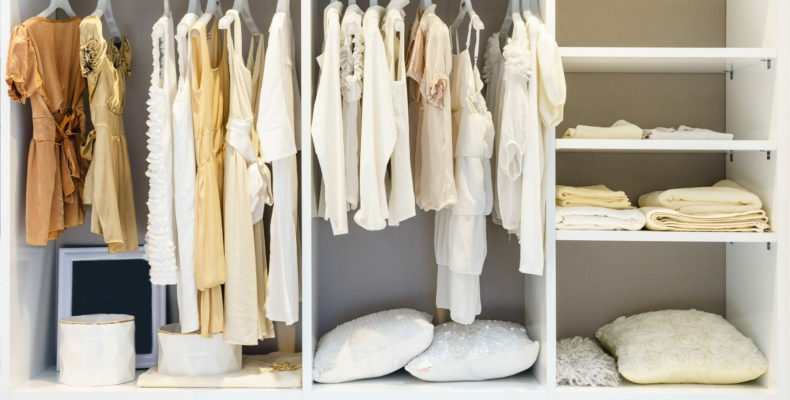 Little touches can turn your average closet into your own personal dressing room. Your dream walk-in closet isn’t meant to remind you of a Target fitting room. Don’t use ugly fluorescent lighting in a room where color and clarity is so important. Consider adding a light up closet rod to give a beautiful and functional splash of light over your clothes.. This way, you’ll not only add to lighting in your closet, but you’ll be able to see every part of the pieces hanging in your closet, too. If there’s any area of your closet not to skimp on, it’s lighting. If you have the ability, considering adding a solatube to your closets ceiling. There is no better light to add to your closet than the natural light of the sun. What good is your brand new walk-in closet if the lighting is drab and depressing? One thing that can absolutely ruin a closet, no matter what size, is the flow. The biggest culprit is doing anything you can to include an island. Make sure to leave adequate walkways throughout your closet while keeping the most use items easy to access, 3 feet is the minimum that we recommend. Make sure you use all of the space that you have. If you have tall ceilings create a 3rd hanging rod or utilize the space with shelving. You can even utilize the space behind the door for a tie rack or belt storage. The shape of your closet will heavily dictate how you utilize the space. No more Googling “how to design a walk-in closet” for you! With this quick, helpful post, we’ve given you some solid ideas for starting your dream closet design endeavor, so you can be storing all of your stuff in style in no time. Need help envisioning the finished result? Contact us today to learn more about our concept renders package, which allows you to see the final outcome of your project before it’s complete.